* A light incense with a touch of incense are the start of Classic Myrrh. * If you blink your eye you will miss the citrus, as it burns off really quickly. * Incense stays the focus as it’s joined by an earthy wood, smoky cedar, and a bright violet. * Incense fragrances are often heavy and overbearing. This one isn’t light, but it’s definitely easy to wear. * An earthy patchouli joins the incense in the base, which becomes quite diffuse after about six hours. Summary: Here is an incense fragrance for those who are afraid of incense fragrances. I’ve found that many incense scents are over the top and scream either “CHURCH” or “HIPPIE.” Classic Myrrh is much more refined – I wouldn’t say subtle, but it doesn’t scream, it’s just there making its presence known with a quiet elegance. I’ve worn this several times and its received several compliments – especially from people who don’t like some of the stronger scents that I wear. If you’re looking for an office scent with personality but that doesn’t call too much attention to you – this is definitely worth trying. Longevity is good and it will get you through the work day, though the base is really a slight skin scent toward the end of its life (eight hours). 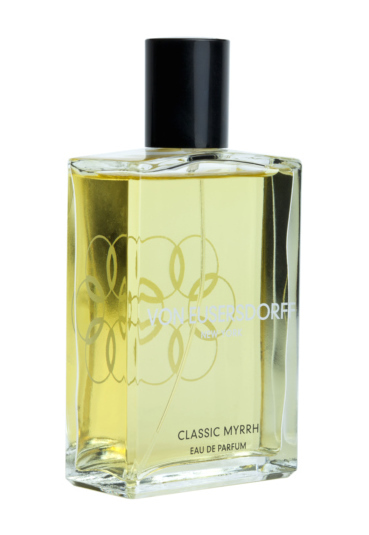 A long lasting and lovely myrrh scent from the house von eusersdorff ny . Thanks for your comment – I really like this one also.